It seems that Volkswagen India is working on minor updates for the Polo hatchback and the Vento c-segment sedan for the Indian market. 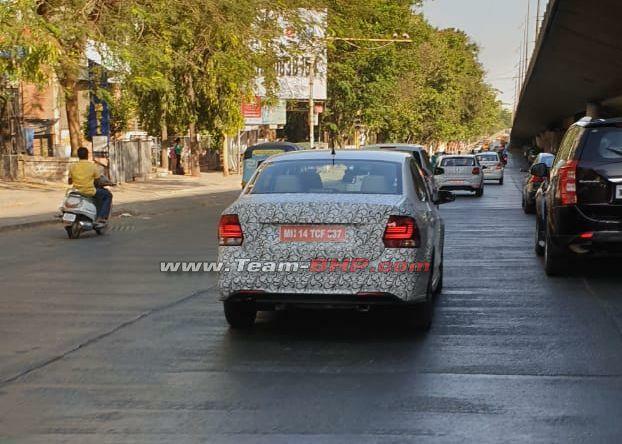 Lightly camouflaged units of the Volkswagen Polo and what appears to be the Vento were recently spotted in Pune. The test mules have their front as well as rear fascia completely covered, hinting that the changes lined-up for the facelifts are mainly concentrated to this area. Media reports state that the facelift for the Volkswagen Polo is likely to come with a GTI styled front bumper. While the rear bumper is likely to come with a dual-tone treatment. The front grille of the updated hatchback is also likely to get a GTI treatment with the chrome strip replacing the red headlights. The headlights will remain the same while the exhaust tip will also remain single barrel instead of the dual one seen on the GTI spec Polo. Also Read: Volkswagen Ameo might be discontinued from India by 2020! The Volkswagen Vento is also expected to undergo a substantial overhaul. The front fascia is going to come with a new design front bumper, new grille and a slightly different detailing of the headlamps. At the back, the tail-lights, the boot lid and the bumper is expected to come with a slightly altered design. The interiors of both the cars are expected to remain the same as before. Both the Volkswagen Polo and the Vento will continue to feature the same engine line-up as before. For reference, the hatchback comes with a 1.0-litre, 3-cylinder petrol engine which is capable of churning out 74 BHP of power along with 95 Nm of peak torque. The diesel derivative comes with a 1.5-litre, 4-cylinder engine capable of churning out 89 BHP along with 230 Nm of peak torque. The Volkswagen Vento on the other hand is available with a 1.6-litre petrol engine. This unit is capable of churning out 103 BHP along with 153 Nm of peak torque. There is a 1.2-litre petrol engine on offer as well which is capable of producing 103 BHP along with 174 NM of peak torque. The diesel engine is a 1.5-litre unit good for 108 BHP along with 250 Nm of peak torque. What are your expectations from the Volkswagen Polo and Vento facelift? Do let us know in the comment section below.